Every summer, I see crapenter black ants walking in the floor, walls, table, etc. They will be gone during winter. i always kill them every time i see them and i do not like them at all. i would like to buy a very effective product for them to go away. i cannot stand carpenter black ants and i freak out. I would like to ask what is the best possible product would you recommend that will help to resolve this problem? I would like to buy but i have no idea which the right product will suits to answer my question. Would you mind to suggets which one please? And oh, i have two indoor cats that i am very concern that it should not be affected by the product that you will recommend. Thank you. Black Carpenter Ants indoors, come from outdoors. That is where the treatment begins and ends. These ants feed on plant juices, aphids, mealybugs, honeydew, etc, ALL of which are associated with plants and trees. They only nest in the wood. They don't eat wood for food. The best overall way and the easiest to get rid of Black Carpenter Ants, is to NOT SPRAY, and give them what they are looking for - food. The KM Ant Pro System is the easiest way to give them their food source (what they are looking for) and eliminate them. This system is safe for cats. There are no easy or cheap cures for these ants. They are one of the most aggressive, and invasive ants we deal with. If you call a local pest company, you will find out that I am preaching the gospel so to speak. The KM Ant Pro system is the only system on the market that is both extremely easy to install, takes very little effort to maintain, and will provide constant feeding up to 4 months before the bait needs to be replaced. 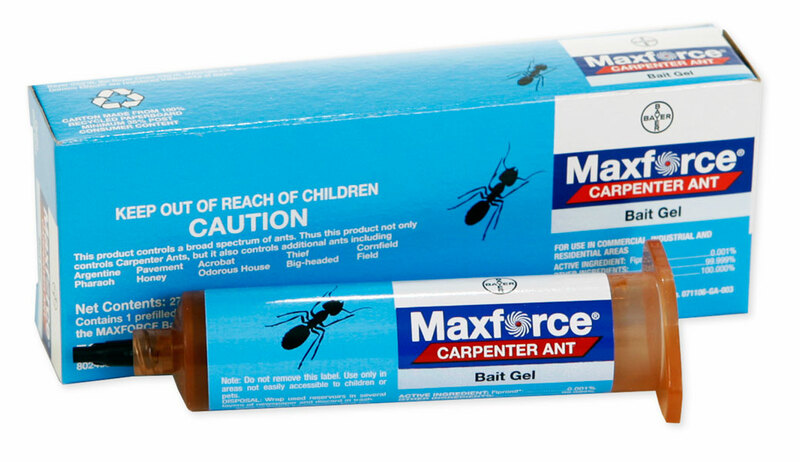 The only other bait that works is Advance Carpenter Ant Bait. This is a HAND scatter bait, scattered around the outside of the house. It has to be reapplied every 3-4 days until the ants consume enough to control them. The stores sell the little ant bait houses; is there something like this that can be used indoors and be more effective(something that is contained is ideal since we have kids)? Is there a way to know if they are in fact damaging studs? The products that we recommend are not sold in stores, at least in most States. In the States that you might find them, they are almost twice as expensive as online. Killing carpenter ants is not a simple process. Using the KM Ant Pro system can make it simpler, but you can't use these products indoors. Ants feed outdoors. They don't eat wood. They only damage the wood to create their nests. The only way to know how much damage is to remove the sheetrock or walls surface to inspect the studs for damage. Most of the time, if the damage is severe, you will find "frass" or sawdust and dead ant particles in a pile close to where the ants are living. Again, the only way to know how much damage is to remove the wall. The Ant Pro system provides an outdoor feeding site for the ants. They normally feed on aphids, mealybugs, plant juices, etc. The Ant Pro station is a dispenser that dispenses liquid ant baits such as Gourmet Liquid Ant Bait. This bait becomes a slow acting killing agent and destroys the ants through their own feeding processes.